This is Hollywood's Best Kept Secret! - But the Secret is out! 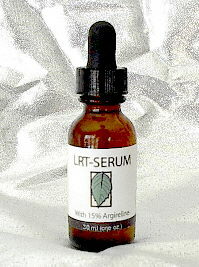 LRT-SERUM contains 15% Argireline� (this is the highest concentration of Argireline available) and Hyaluronic Acid. Argireline� is a revolutionary, breakthrough skin relaxant ingredient that has been clinically proven to reduce the degree of existing facial wrinkles and has been demonstrated effective against the formation of new ones. It is especially effective around the eyes, forehead and upper lip. Commonly referred to as "Better than Botox�"
Argireline�, the active ingredient in LRT Serum, is a safe, non-toxic, topical alternative to botulinum toxin type A (Botox�), that has been scientifically proven effective in reducing wrinkles and preventing the formation of new lines in a safe and natural manner. Thanks to substantial progress researchers have made in understanding the cellular changes that bring about skin wrinkling and sagging, this remarkable new serum has been developed. Argireline� is a patented blend of amino acids (the building blocks of protein). Research shows a 17% reduction in the depth of fine lines and wrinkles after 15 days and up to 27% following 30 days of treatment. 1. The SNARE complex a natural formation of proteins in aging skin that stimulate neurotransmitters, provoking facial muscle contractions, thereby causing wrinkles and lines. 2. The overproduction and release of catecholamine-hormones, such as adrenaline, which affect the sympathetic nervous system and cause wrinkles through repetitive facial movements. Directions for Use:Apply twice a daily (AM/PM) to clean, dry skin. Use a small even amount, gently massaging the areas around the eyes, forehead and lips with your fingertips. *Botox�, is a registered trademark of Allergan, Inc.